Get your shaker, muddler, and strainer out and try your hand at a few iconic cocktails this summer. Here in Florida, we are lucky to have some of the best citrus grown right in our state, so why not learn how to celebrate those citrusy summer flavors with a few refreshing craft cocktails? Here are Delray Station’s top five cocktails to help celebrate the season in style. You don’t need a slice of key lime pie to enjoy the sweet and tart flavors of the ever-popular Florida citrus. The simple combination of key lime juice, agave nectar, and cachaça will make any day feel like a vacation. Never heard of cachaça? It’s a spirit made from freshly pressed cane sugar and is a great bottle to have in your bar. Fun fact - cachaça is the national spirit of Brazil. Being the gracious host with a pitcher of a signature cocktail is easy with this overnight sangria recipe. Get your friends together for a sundowner on your private patio or balcony and let this show-stealing sangria flow. Choose your favorite seasonal fruit and a bold red wine and you’re well on your way to making this set-and-forget, crowd-pleasing cocktail. If you’re not in the mood for sangria at home, try out the sparkling pineapple sangria and other killer cocktails at nearby Corner Porch Restaurant & Bar. When done right, it’s hard to beat the perfect balance of this iconic cocktail. Instead of reaching for a pitcher of neon green premix, try making a classic margarita from scratch and see if it isn’t the most refreshing thing you’ve ever tasted on a balmy evening. The best part about a classic margarita is there’s minimal equipment needed – just a cocktail shaker and a handful of quality ingredients. Tip: Enjoy your margarita on the rocks - leave the blending for your morning smoothie. We know that sometimes there’s nothing better than an ice cold beer among friends. Fortunately, our location in the heart of Delray Beach makes it easy to enjoy some great local brews straight from the source. Delray Station is a short walk from Saltwater Brewery where you can sample their seasonal beers and year-round offerings. We’re interested in their seasonal Passion Pit - a session golden ale aged with passion fruit. See you there! There is something universally refreshing about the mixture of ginger and lime. If you’re a true ginger fan, make sure to opt for ginger beer, which contrary to its name is non-alcoholic and more gingery than it’s tamer cousin ginger ale. 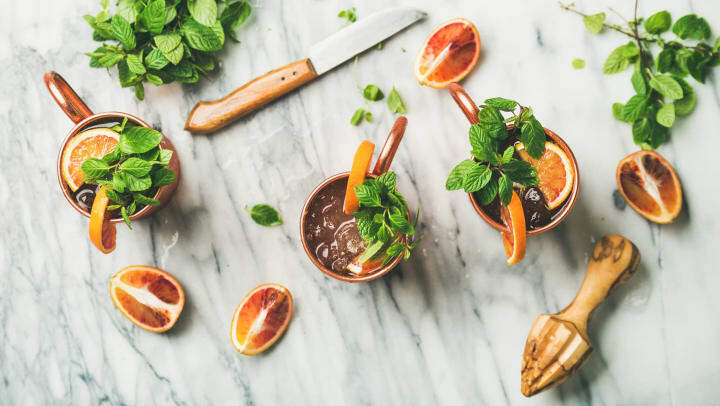 For a true Moscow Mule experience, grab some copper cups, which can class-up almost any beverage. That’s Delray Station’s roundup of our favorite cocktails to help kick off summer - whether you’re making cocktails at home or headed to Salt7’s happy hour, you’re sure to have a good time. So what are you waiting for? Get the crew together and start enjoying the taste of sunshine and good times.